For adult cats, feed 1 to 1 1/4 cans per day per each 7 pounds of body weight. For pregnant and nursing mothers and for kittens up to 1 year of age, feed up to 2 to 2.5 times as much as for adults or up to 3.5 cans per day. The amount of food your cat requires will depend on activity, age, environment and breed. Feed at room temperature and refrigerate unused portion in a non-metallic container. Remember to always keep fresh, clean drinking water available for your cat. 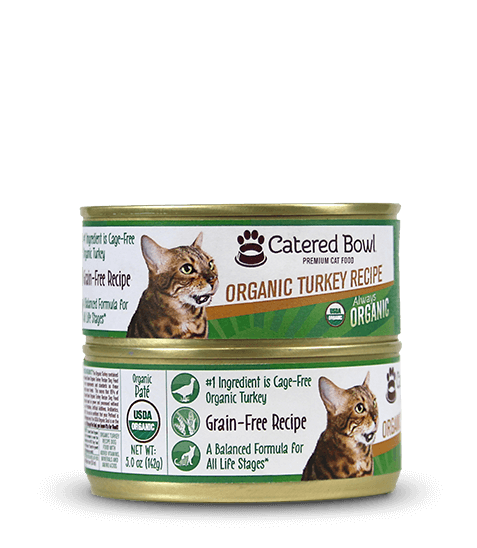 When changing to Catered Bowl Organic Turkey Recipe Cat Food, some cats may do better by making a gradual transition over 10 days. Start with 25% of the new food mixed with 75% of the previous diet, and gradually increase the new while decreasing the previous until the transition is complete.